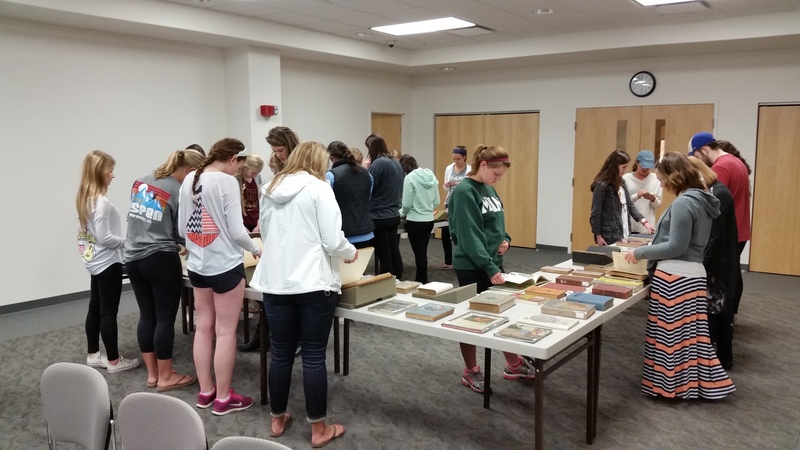 One of Miami University’s greatest assets is its extraordinary collection of more than 95,000 rare books, manuscripts, and other primary source materials. We believe these materials are here to be used, and so we encourage professors in all disciplines to consider including Special Collections in their courses. Students who visit Special Collections learn to conduct research in an archival environment, and they develop the skills needed to locate, identify, interpret, and think critically about primary source materials such as nineteenth century letters and diaries, early modern printed books and manuscripts, twentieth century political posters, and more. Class sessions in Special Collections are always adapted to the class’s specific needs. We offer several approaches to instruction based on the instructor’s goals for the course, and we always encourage students to contextualize, investigate, and interact with historical documents. If you are interested in using Special Collections materials to enhance your class instruction, consider partnering with a Special Collections staff member; we would be happy to help you plan a visit to Special Collections and/or design a learning activity that incorporates our rich collections. To schedule a visit, please fill out our request form here! What are my options for a class visit? Can students handle the materials? Yes, we encourage hands-on activities with our materials that empower students to become confident and responsible scholars. We provide a general orientation to the care and handling of the materials and some materials may have handling restrictions. We can accommodate up to 35 students easily, but we can investigate other options for larger classes. Can I put Special Collections materials on reserve for students to use in the reading room outside of their class time? Yes, we often keep materials on reserve for classes. When using materials in our reading room, students will need to register as researchers and follow reading room procedures. Can materials be made available online? None of the materials may leave Special Collections, but depending on the items we may be able to digitize them and make them available online for classes, projects, and research. Restrictions may include: the condition of the material, the extent of the material, copyright restrictions, and time limitations, so please notify us as soon as possible if you are interested in having Special Collections materials be digitized. Technology support and software recommendations (e.g. Omeka) for online exhibits and projects are also available. Please contact us as far in advance of your class as possible to avoid scheduling conflicts. Please provide a copy of the class syllabus for planning and selection purposes, along with a head count for the visit. We also encourage a preview meeting between the professor and librarian to preview materials and discuss the learning objectives of the class and how best to achieve them.